Upper Deck has been creating quite a buzz at the 2012 National Sports Collectors Convention with the company’s popular wrapper redemption program, some other unique redemption programs and a case breaker promotion. 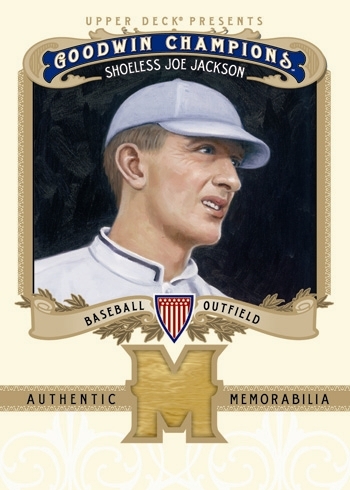 Nothing however could have prepared collectors for the surprising news to come out of the show this week that Upper Deck would be including a limited quantity of game-used bat cards of one of the most polarizing figures in baseball history; “Shoeless” Joe Jackson. Upper Deck was able to procure an authentic game-used bat from Shoeless Joe Jackson that he used during his barnstorming days in the mid 1920’s. A portion of this historic piece of lumber was used to create a limited run of two separate cards (a single swatch and a very rare multi-swatch variation) within 2012 Goodwin Champions. These truly historic artifacts will be inserted randomly into packs for collectors to find when the product releases on August 14. This marks the first time since 2001 SP Legendary Cuts that Upper Deck will include game-used bat cards of Shoeless Joe Jackson in a trading card release. When Jackson played his first full season he batted .408 for Cleveland; a record that still stands for rookie seasons. He led the White Sox to a World Series title in 1917 against the Giants. In 1919 Jackson found himself back in the World Series where he batted .375 with perfect fielding, but the Reds went on to win the title. The next season, while batting .385, he and seven other members of the White Sox were suspended under allegations they threw the series. All eight members were banned from baseball for life in the historic “Black Sox” scandal. In 1921, a Chicago jury acquitted Jackson of helping to fix the 1919 series, but his ban stays in place to this day, despite several petitions to see him reinstated. Thats awesome! Goodwin Champions is always a great product every year and this years looks like the best yet! the ban on jackson is b.s. in the 19 w.s. not only did he go without an error and hit .375, but he through out two runners at the plate in the series!!!! And this is why I love Upper Deck. An awsome product just got sweeter, I didn’t think you could top the Civl War Museum Relics and the It Came From Outer Space relics but you just did. Baseball was ruin for my son and I when the deadly strike came and Tom Glavine headed up the players union. That was it for us. I would like to get some of Shoeless Joe’s though that would be awesume.